Anyone who has served in the military knows how important it is to maintain discipline in the ranks. The chain of command is essential. Dissention and disobedience in the ranks will hinder any military operation and may well prove to be disastrous. 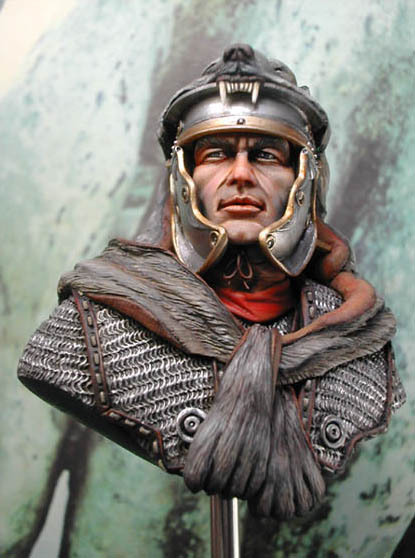 Centurions in the Roman army were officers with authority and under authority. Their rank would have been roughly equivalent to that of a captain in today's army. A centurion commanded a company--a centuria of soldiers numbering anywhere between 60 to 100 men depending on various factors, including the moment in history. They were experienced soldiers and well trained. There are several significant details in Luke's story that are noteworthy. First, the centurion himself is not in the scene. His message is delivered to Jesus. Second, he has been a benefactor to the Jewish people, financing the construction of a synagogue. Centurions would have been on the wealthy side of the economic scale. They were paid twice as much as the average run-of-the-mill soldier. We do not know what motivated this military man to offer such financial support to the religious life of the Jews-- he could simply be acting in a respectful manner wishing to support the religious institutions of the people his empire occupies. It could also be the case that he was a God-fearer, a Gentile attracted to Judaism and who perhaps even worshipped Israel's God without becoming a convert. Third, his support is significant enough that Jewish leaders in the community are more than willing to bring his request for the healing of his servant to Jesus. Though there were tensions, Jews and Gentiles also got along and did work together. The centurion appeals to Jesus based on his own experience as a soldier. He commands those with inferior rank and he expects and assumes that his orders will be carried out without having to witness their execution in person. If he says it, it will be done. In the same way, when his superiors give him an order, he dutifully carries out their commands without question or delay. It is this world of the centurion, where authority is everything and order in the ranks is essential that provides the context for his request. The centurion recognizes that Jesus has his own authority, and with a word whatever Jesus says will happen. At the same time, he must also understand that Jesus' authority comes from someone else. He acts on behalf of the God of Israel. It is this God who has given Jesus the authority to teach and to heal. If Jesus so chooses to exercise that authority, a command-- a word-- is all that is needed. This story has the kind of paradoxical punch the parables do—the Good Samaritan, the mustard seed as metaphor for kingdom of God, the devout and humble tax collector contrasted with the self-righteous Pharisee. Here we have a Roman soldier, of whom people would be rightly suspicious, displaying a confidence in Jesus as spiritual Commander that Jesus seems to find compelling. Acts of faith can come to us from unexpected places and persons. There are persons for whom life seems to throw them one curve ball after another, and yet they continue to thank God for God's goodness. Others, who we are sure are outside of the company of the saints, act in ways that demonstrate their trust in God, even though they speak little of it. And then are those who surprise and perhaps embarrass the ecclesial insiders by being the presence of God to others when the "chosen" are too cautious to act. God's Spirit can break out in all places and offer holy moments in the midst of the mundane and, yes, even the profane. Such faith is often unexpected... and it is amazing.